Henning Mankell is best known for his crime writing, especially his novels about the world weary Swedish detective, Kurt Wallander. 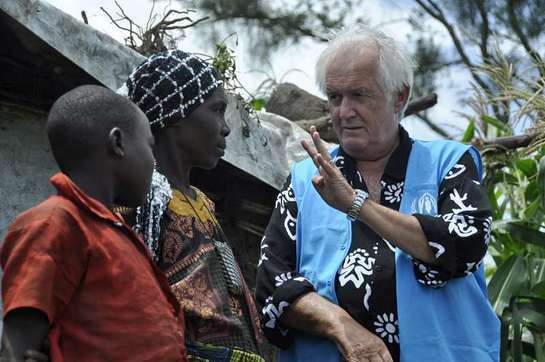 Henning Mankell talks to a Congolese refugee during his recent visit to the Rwamwanja refugee settlement in Uganda. Mankell was taught to read and write as a child by his grandmother and wrote his first play at 19. He says that he has always been driven by a desire to be a storyteller, writing about the human condition. His interest in what makes people tick has also fuelled his passionate and active humanitarianism and his concern for the needy and the vulnerable, including people forced to flee their homes because of war or persecution. His interest in refugees and the work of UNHCR grew in the 1980s when he began spending time in Mozambique, which was embroiled in civil war (1977-1992) after the struggle for independence from the Portuguese (1964-1974). Last month, the 65-year-old author visited the UN refugee agency’s operations in Uganda, including a refugee settlement at Rwamwanja and a transit centre in Kisoro district, neighbouring Democratic Republic of the Congo’s North Kivu province. Less than a month after he visited the Bunagana crossing, thousands of refugees streamed into Uganda to escape a final government push against rebel M23 fighters in the DRC. Mankell spoke to UNHCR External Relations Officer Lucy Beck about his experience and about the visit. You still spend half your year in Mozambique. What is it about Africa that attracts you? As a very young author from Europe, I was quite sure that in order to understand the time in which I live and the human condition, I had to see the world from outside the European perspective. The most basic perspective I could find was the African one. When I go back to Mozambique in two weeks’ time, I will do it for the same reason as I did nearly 40 years ago. What made you first get interested in refugees? Europe after the Second World War was a continent of refugees. In many ways the image of our time was an image of refugees, and you cannot talk about our time without talking about refugees – who becomes one and why? We need to help refugees find themselves and find an identity. As a result I have written a lot about refugees during my lifetime. What was your first experience with a refugee or asylum-seeker? When I was 17 or 18 years old I met some refugees from South Africa who had fled apartheid, and I realized that no one flees without very strong cause . . . When you don’t have any other possibility, you flee to survive. The definition of a refugee can never be the same as migrant – a refugee flees for his or her life. Now, after my trip to Uganda, I realize this definition is the only one possible. I only had a few days, but UNHCR made a very compact programme. We saw what UNHCR does, right from the first meeting with refugees at the border to the situation of those who have been settled for quite some time . . . What I felt was that individual stories were enormously important – I was very shaken by some of them, and this is what I am trying to write about. The trip confirmed how well UNHCR is trying to meet all the challenges. I feel like I now know much more. Why did you choose to support UNHCR? For many reasons. UNHCR is the dominant movement in the world when it comes to trying to help refugees. I have experienced the work of UNHCR since the 1980s when I lived in Mozambique. There were around 1 million Mozambican refugees in South Africa, and I visited the camps. I could see it needed a big organization to tackle this huge problem and I think UNHCR had the tools to take on this challenge. I have found that there are very dedicated people working for UNHCR and it is also good that money comes from not just governments, but also individuals. I also visited the camps in South Africa about 16 years ago, when I was invited to perform and interact artistically with the people there. I met the former High Commissioner for Refugees Sadako Ogata, who was very positive about using art to talk and raise awareness about the refugee situation. Do you have a message about those forced to flee their homes, losing everything? We all dream of a life where refugees are not living in misery, and the one thing that we can do is do more and more to see that refugees aren’t suffering unnecessarily because of the situation created by others. This we can always do and we must do – it is our responsibility as human beings.